The most foundational question about human existence is the question about the meaning of our existence. There must be a reason to live, there must be a reason to love and to suffer. For doing anything worthwhile in life, there must be a reason, there must be an explanation. It is in fact this ‘meaning aspect’ of the human existence that makes it essentially different from all other existences in the universe. The aim of all great thinkers who reflected seriously on human life has been discovering the meaning of life, because they knew that a life not supported by meaning is not worth living. Human acts, not enlightened by meaning are futile. One fact that could shed the greatest light on our reflection on the meaning of life is the resurrection of Jesus Christ. Or in other words, only in the context of the resurrection of Jesus Christ can we fully understand the meaning of human existence. The resurrection of Christ is the core of the Christian faith. The incarnated Son of God goes through all the painful human experiences in their maximum intensity and dies. Apparently that life was a failure. But on the third day, defeating death itself, that life rises in glory and lives forever; consequently, all the values and goodness which that life witnessed to, also live forever. Seen through the light of the resurrection, that life turns out to be the most meaningful life ever lived on earth. During the Holy Eucharistic celebration according to the Malankara rite, after the words of consecration, the congregation makes the following proclamation: “We commemorate your death, we confess your resurrection and we look forward to your second coming”. The integrity of the Christian faith consists in these three aspects, namely, our identification with the death of Christ, our faith in His resurrection and our hope in His second coming, that is, in the possibility of our participation in His resurrection. These three things give content to our faith and they make our life meaningful. The identification with the death of Christ is our participation in the very life He lived. It is our participation in His life-surrender for the sake of love and in all the life-experiences that such a surrender entailed. These experiences are bound to involve great suffering and defeat. It may even look as if the total outcome of such a life is only pain and loss. But only such a life style can be in the final analysis productive of meaning. What makes a Christian capable of living a life sharing in the death of Christ is a faith and a hope. This faith is the living conviction that Christ rose from the dead and this hope is the assurance that we will also participate in His resurrection. An existence that is not strengthened by the hope of resurrection would lack in meaning. All our attempts at loving and all our experiences of suffering in life need an ulterior reference that would justify all these attempts, give meaning to all these experiences and guarantee the ultimate worth of our life itself. This reference is our hope of sharing in the resurrection of Jesus, because His resurrection signaled the ultimate victory of goodness over evil, the triumph of love over hatred, the defeat of selfishness and the victory of universal brotherhood. Any attempt at loving and suffering without this reference need not be meaningful. 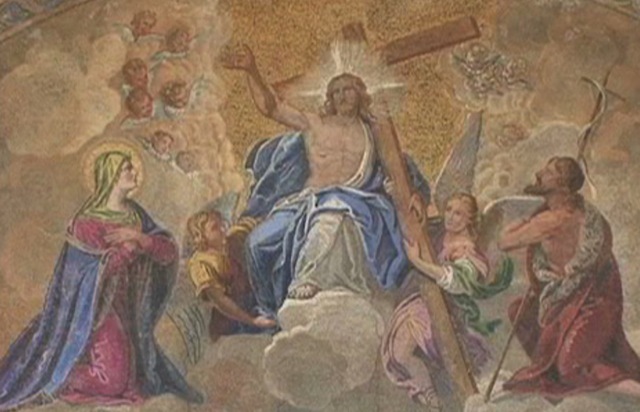 But the basis for our hope that all our acts of love and goodness in this world will be ultimately fulfilled with the gift of resurrection is our firm faith in the resurrection of Jesus Christ – our faith that the incarnated Son of God defeated all the possible defeats to which a human life is subjected to and rose in glory. That is why St. Paul says, “If Christ has not been raised, then our preaching is in vain and your faith is in vain.” (I Cor. 15:14). The guarantee for the ultimate meaning and fulfillment of the human life is the resurrection of Jesus and our faith in it. A person who has this faith, a person who enjoys the hope that this faith gives, has a reason for living, a reason for loving and a reason for suffering and dying for the sake of love. I wish all of you the joy and peace of the Risen Lord!